Gorgeous sunrise. The sun’s rays crept slowly over the mountain peaks. Dressed and headed across the central clearing to the dining room, where we watched local birds gather to feast as we ate. 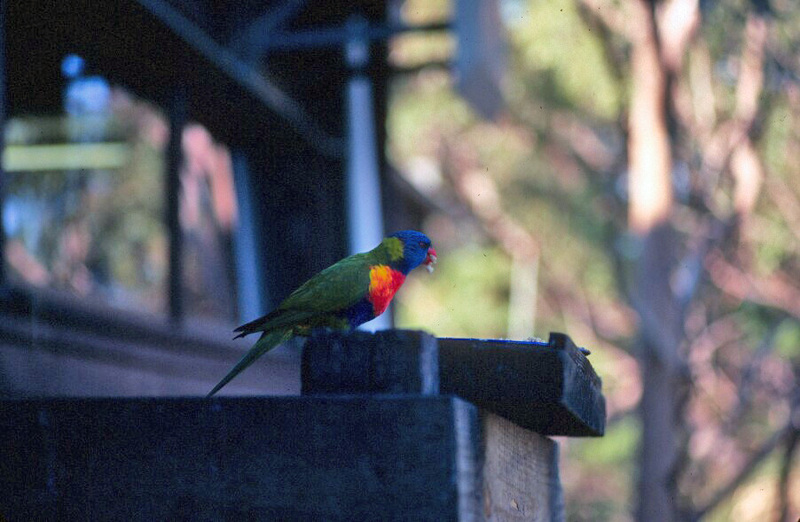 On the balcony, in the surrounding trees, and at the bird feeders, there were catbirds, rosellas, currawongs, and, especially abundant, rainbow lorikeets. Noisy and delightful gathering. I was surprised at how completely the bright red crimson rosellas vanished amid the green leaves, when they landed in the trees. Binna Burra’s resident ornithologist, Glen, came around to each table, to meet those who were going on the hike with him. Our lunches had already been packed, and backpacks with food and water were supplied. At 9 o’clock, we gathered outside the dining room. Besides Glen, there was Glen’s wife, Jenny, who is a botanist, plus the 1/2 dozen other hardy souls about to embark on one of Binna Burra’s “long walks.” Glen is perfect for this place: lean frame, piercing eyes, full white beard. Jenny is absolutely dear, but looks less like a wild mountain type than her husband. She has short, salt and pepper hair, amused eyes, and a gentle voice. 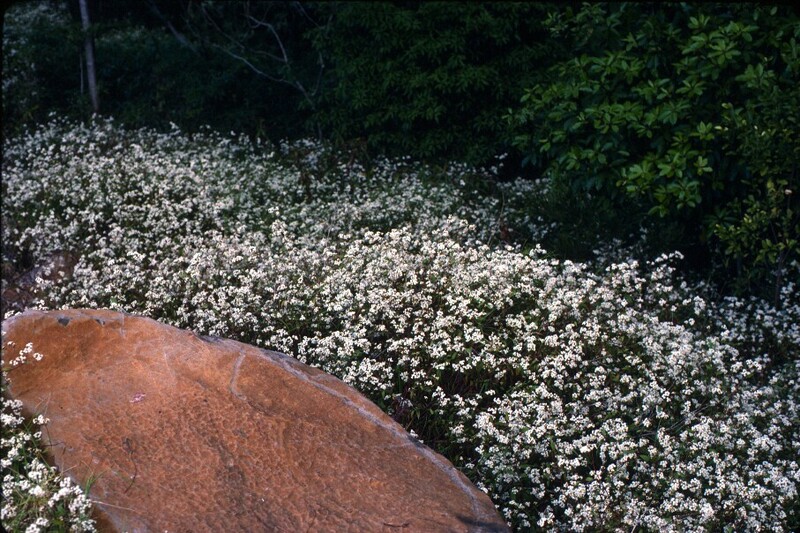 But she is very knowledgeable, and even the tiniest rock orchid does not escape her notice. The walk started out easily enough: drop down from the lodge into the forest through a thicket of purple-flowered wild tobacco and white-flowered mist-of-the-mountain (beautiful but not indigenous, and considered a nuisance). We stopped when Glen spotted a pair of brown wood pigeons, and then we continued on. A sign directed us toward the Ship’s Stern Circuit and gave a distance of 19k. However, Glen said our walk would be a bit longer than that, probably topping 23k, because he wanted to detour to the Lower Ballanjui Falls. The forest closed around us, cool and green, a riot of palms, figs, ferns, gums, vines, stinging trees, mosses, and a million other green things. The sounds of birds were around us everywhere: the snapping whistle of the whipbird, the warble of the yellow robin, the cry of the noisy pitta, and a half dozen other musical calls. At one spot, the ground was littered with odd, red, bell-shaped berries. Glen picked one up and identified at as a sour cherry. “You can try it if you like,” he told us. I thought he was joking, but when he bit into one, I picked one up, too, and tried it. It was a bit crunchy and tasted rather like pomegranate. After a couple of kilometers of hiking, we came to a clearing. On the far side of the valley was a towering wall of green. 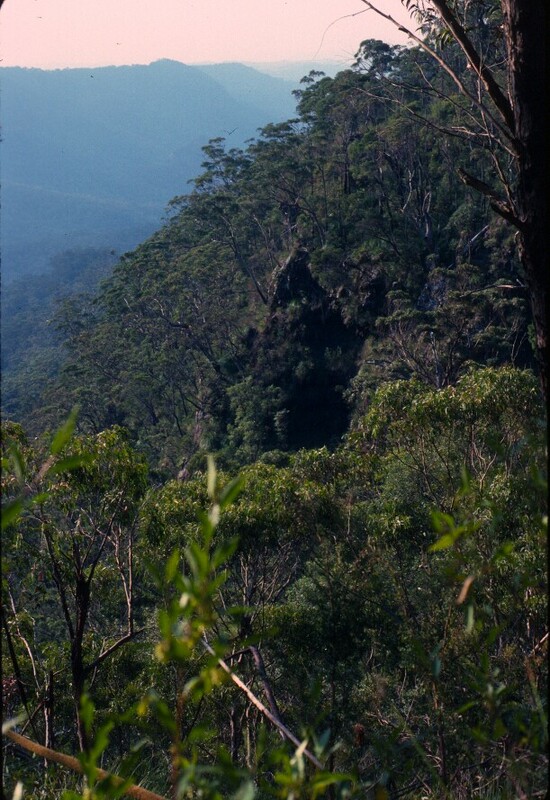 Glen told us that it was our destination, that we’d drop into the valley and then climb up the other side, hike out to the point (the Ship’s Stern), and then follow the rim around to Binna Burra again. I looked at the valley 1,500 feet below us and asked, “Drop down into that valley?” Yes. After lunch, I took another walk, this time along the short “Rainforest Circuit.” (Signposts name and point to possible paths and tell how long they are.) This was a beautiful trail. The greenery was lush and abundant. I saw figs, gums, palms, lianas, monsteras, ferns, and more. There were some interesting flowers. One flower-covered tree (which another hiker, who passed at an opportune moment, identified as pittosporum) is one of the most intoxicatingly fragrant trees I’ve ever encountered—cleaner and stronger than jasmine. Incredible. I saw pademelons (small, kangaroo-like marsupial) hopping through the brush. The birds I saw included currawongs, magpies, crimson rosellas, scrub turkeys, quail, and a wood pigeon. I could hear whipbirds (which are far more commonly heard than seen: check out the sound here), and an occasional bellbird, magpies, bowerbirds, and half a dozen things I couldn’t identify. It was wonderful. And I get to stay here for another day and a half! Back to my room to freshen up for the evening. Glad I brought a sweater. It’s surprisingly chilly up here. Now, it’s time to head for “Beethoven in the bush”—music, munchies, and mingling before dinner. Fascinating sunset. 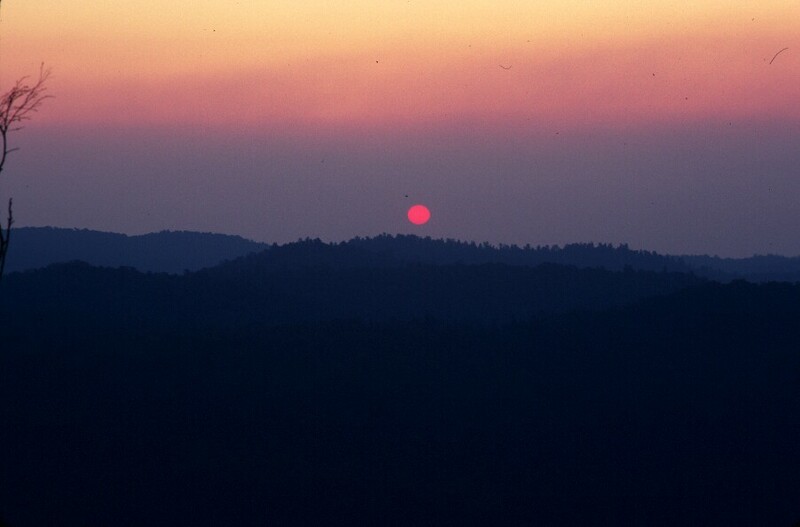 Usually, one needs clouds to add interest and color to a setting sun, but this evening, smoke from distant fires caused the light diffusion needed for a colorful sky. We watched from the library, which, like everything else, has an incredible view. As promised, Beethoven was playing in the background. Beautiful. I met a lot of charming people during this pre-event time and even more over dinner. Dinner was lovely and abundant. Then, it was back to the library for a slide show by noted Australian artist Rex Bachkhaus-Smith. Rex creates wonderful watercolor paintings of Australian subjects, most of them with nature themes. Quite remarkable work, and he seemed like a delightful man, as well as. Then, early to bed. I’ve been told the sunrise is remarkable here—plus, I’ve signed up for one of the long walks with the naturalist for tomorrow. WOW. This place is fabulous. 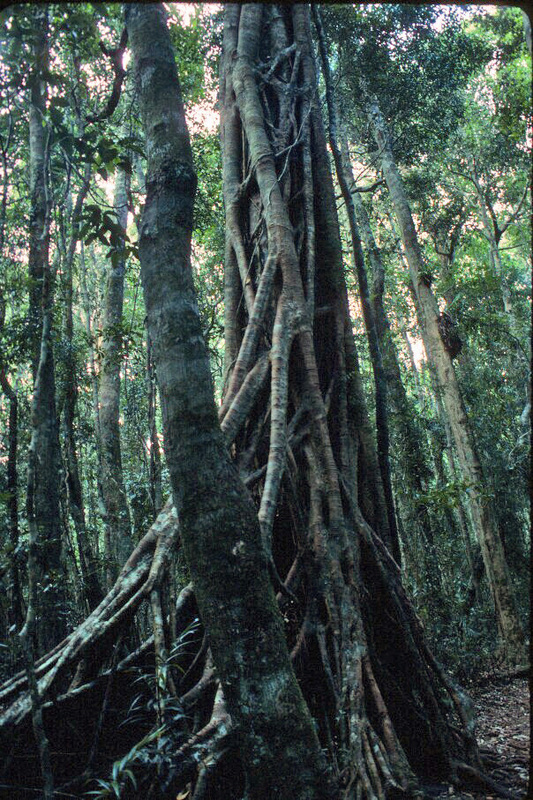 I had previously fallen in love with Lamington National Park, during my first visit to Australia, and the splendor of the rainforest had drawn me back here. However, Binna Burra itself is beyond expectactions. I can hardly express how gorgeous it is. Hewn from the wilderness in the 1930s, the lodge and all its furnishings, are made from the wood cut and stone moved to create the clearing in which the lodge sits. Every view is unbelievable. There is a fair range of room types, and I went for a budget room/cabin. 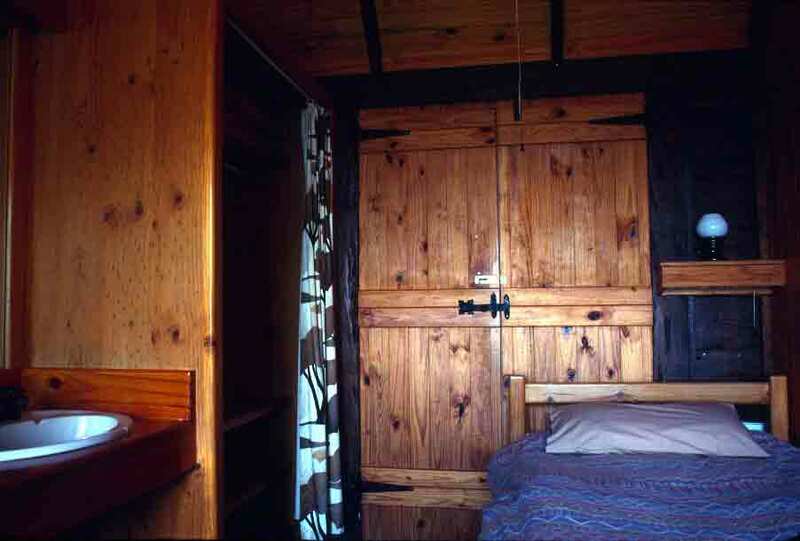 My room turned out to be charming–all wood interior, fixtures, furniture; comforter on the bed. The view from my bedroom window is incredible. It is so quiet up here. Not quiet as in no sound, but quiet as in no sounds of civilization. Nothing except the breeze through the trees and bird calls. I don’t think we even realize how many sounds we just filter out back in the “real world.” The silence is immense. I went for a walk, to find my way around the place. I was surprised that I felt out of breath pretty quickly. Then I remembered–I’m on the top of a mountain, and the air is a bit thinner. (Just 2,625 feet above sea level, so not exactly inducing altitude sickness, just a little less air. Either that, or perhaps my lungs are in shock because the air is so clean.) I’ll have to take it a little easy today–and hope I adjust quickly. The incredible silence was broken for a moment by a ringing bell that announced lunch. The dining room is fabulous–perched on the edge of a cliff. 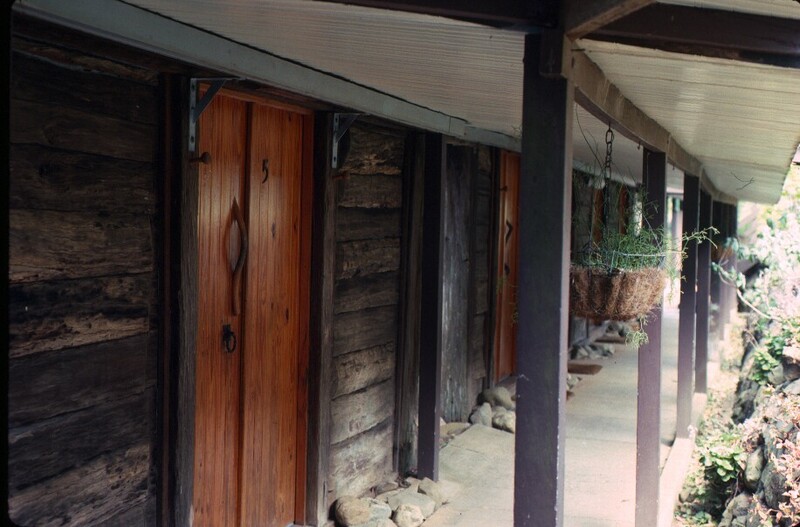 Wood walls face the clearing where accommodations are located, but the outside wall is all glass, so there is an absolutely unobstructed view of the mountains, valleys, and forest surrounding the peak on which Binna Burra sits. Stunning. And the food was good and abundant, with multiple options, including seafood and vegetarian. One could not easily go hungry here. At lunch, those of us who were new arrivals were given a bit of info about when things happened and how things operate. There are meals and snacks multiple times during the day, plus if you want to go off into the wilderness, they’ll pack a lunch for you. Nice. There are naturalists, a botanist, and an ornithologist here, to answer questions and lead regularly scheduled walks, both long and short, to make sure we have the opportunity to see as much of the rainforest as we want. Everyone else I saw or met seems to be really into this outdoor experience. Hiking gear, binoculars, cameras, and piles of books are very much in evidence. It’s good to know people still care. At home, I so often encounter people who aren’t interested in seeing anything, and if they see it, don’t want to learn more about it. Here, everyone was prepared to not only look, but to look it up. Wonderful. The view is amazing, but I’m not sure how my photos will turn out, since the mountains are somewhat obscured by the smoke from nearby forest fires. During lunch, I was told that the fires have been quite bad this year. Sad. And yet, even with the haze, the view is unbelievably inspiring. Even with the smoke, the view is inspiring. Up early. The sunrise was lovely this morning. My window faces away from city center, and I can see some of the older Brisbane, which is comforting. Below me are corrugated iron roofs and quiet streets lined with palm trees. There are also a lot of tall, new buildings, but they are more in the distance. I packed what I needed for a couple of days in my daypack, left my larger bag in the luggage room at the hotel, shouldered daypack and camera equipment, and headed out the door. I must say that, in the morning light, and with more people out and about, Brisbane is quite lovely. However, it’s a city, and I didn’t really come back to Australia to see cities. Which was why my destination was the Brisbane Transit Terminal on Roma Street, and not downtown. My walk was fairly short but pleasant, through gardens and parkland adjacent to the Transit Terminal, and past the old, 1876 Roma Street Train Station. Reassuring to see that history and nature are part of the plan, as the city continues to modernize. The Transit Terminal is a fairly large complex and is the hub of city transport–all buses (tour, long distance, and local), taxis, and trains. There is also a hotel and a number of shops useful to travelers: chemist (pharmacy), newsagent, and food, including meat pies–which I no longer need, as I had breakfast, but I was pleased to know they were still available. Funny how, even though I don’t really expect everything to be the same as it was on my first trip (including me–I’ve changed, too), I still hope for some things to be untouched and familiar. I’m now sitting on the little Mountain Coach Co. coach, ready to head up to Binna Burra. I’m in immensely good spirits and sorry only that I don’t have six months this time (or at least a few more weeks). Just as I was on my first time in Brisbane, so too now, I am vividly aware of how unlikely it is that I’ll ever get to see everything here. Oh, well–“not enough time” is pretty much how I feel anywhere I travel. As we climb into the mountains, I noted that the phone wires are strung from tree to tree, and utility poles are only used where there are gaps. That’s one definite advantage to having lots of tall, straight trees. Morning break at Canungra. We stopped in the center of town this time. It’s still a very small town, but it is built up just enough that it was not really recognizable. 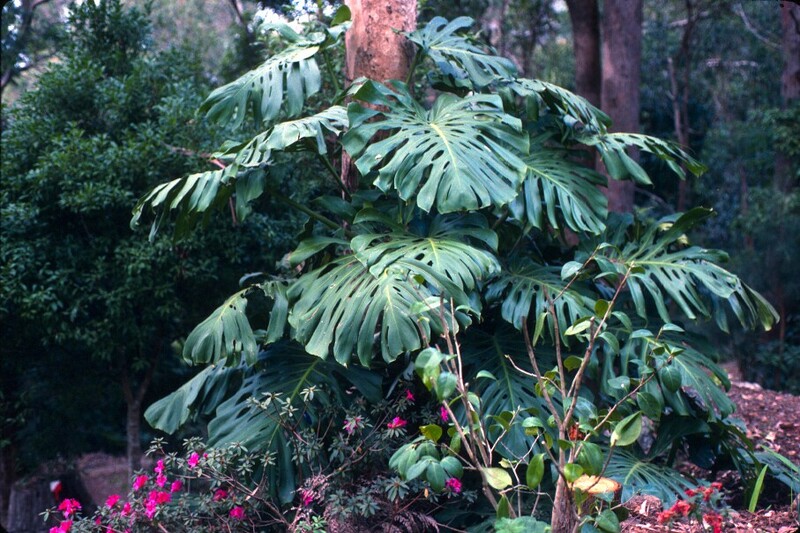 That said, my main memory from my previous very short stop here was of the dark wood of the tearoom and a very large staghorn fern growing there. Then it was off for a long, steady climb into the mountains, to Binna Burra. Then it was on to Brisbane. I had no trouble getting to Brisbane, but once I was in Brisbane, I wasn’t doing so well. I had no idea where I was going, and since the car rental place closes early on Sunday, I had a limited amount of time to find it. The car rental place in Sydney didn’t have maps of Brisbane (why, if someone is renting a car to drive Sydney to Brisbane, wouldn’t a rental company think to supply maps? ), plus they had been unable to give me any directions to their Brisbane location. The map I did have was one page of a travel guide that was several years old. That got me in the neighborhood, but all the one-way streets were defeating me. I began to panic. Because it was Sunday, the business district was close to deserted, but I finally spotted a policeman, and he was able to direct me to the car rental place—which I reached 10 minutes before closing. I was fairly shaking from the adrenalin rush, but the charming attendants calmed me quickly, and, because it was closing time and they were leaving, they offered to drive me to my hotel–which did make me feel more kindly toward the map-free rental company. I had booked the hotel I’d stayed at on my first trip to Australia–because, of course, I had to. It was where I’d begun the starting over. From the outside, it doesn’t look any different, but inside, it is not what it was. As the man at the front desk noted, “It has different owners and management now. You might notice some changes.” Well, it’s not awful, but it’s not as nice as it was, and that was a bit disappointing. Still, though a bit more tatty, it is clean. I dumped my stuff in my room and then went for a walk through town. Brisbane has changed, too, at least the downtown part. I’m sorry to see that the old parts I’d loved seem overwhelmed by new buildings. I suppose if I’d never been here before, I’d be really impressed with the sophisticated glass and steel towers that are so abundant now, but I miss the Brisbane I knew. I walked down to the Botanic Gardens and was relieved to see how little they’d changed. I knew this place. I recognized trees and plants. I walked along a still-familiar riverbank. I would have stayed longer, but the sun had set, and I wanted to get back to the hotel before it was totally dark. The afterglow of the sunset made a spectacular, flame-colored backdrop for the city. As I walked, I looked for somewhere to get a meat pie, since it was one of those dishes I’d come to love on my first trip. However, nearly everything is closed on Sunday evening, so I headed back for dinner at the hotel. Asparagus soup and a steak were wholesome and comforting. The people at the hotel are actually very nice. More of a pleasant, thoughtful, efficient nice, as opposed to the “pull up a chair and join us for tea and a chat” nice I encountered before. A bigger city nice–but still nice. And they are going to let me leave my suitcase here for the two days I’ll be at Binna Burra, which helps me a lot. Anyway, it’s time to think about calling it a day. I certainly had a fair bit of fresh air and exercise today. And tomorrow, back to the rainforest! Up early. For breakfast, I had the “ashi fruit” I bought in town last night. It actually didn’t match the description I’d been given; it was more like a cross between fruit salad and cucumber. Not a big flavor, but very juicy and refreshing. Then on the road again, ever northward. Ballina is really lovely as soon as you get out of the commercial district. I left the Pacific Highway and took the coastal road. The view of Lennox Head as I came through the hills was spectacular, with craggy cliffs giving way to long beaches. Morning light danced on the ocean, and everything is green and increasingly tropical. On through lovely, rapidly changing countryside–forest, coastal scrub, beaches, towns–to Byron Bay. Byron Bay is a beachfront town famous for its splendid beaches–and for being the eastern most point of mainland Australia. 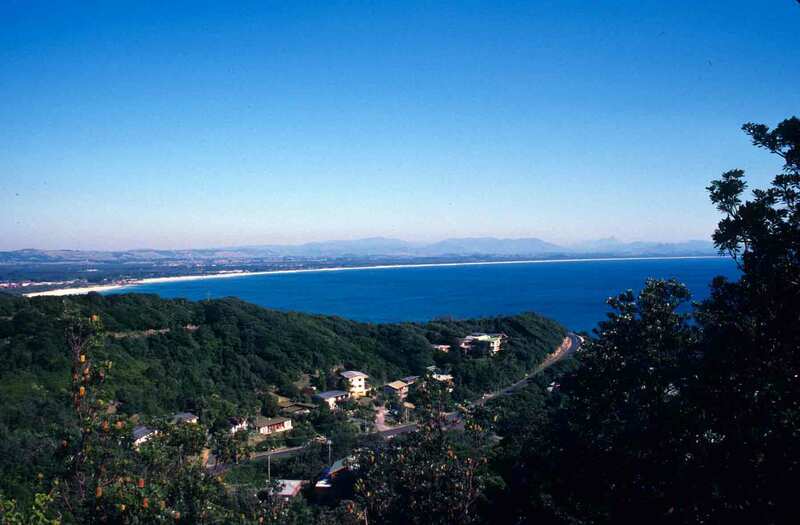 The town and nearby Cape Byron are largely surrounded by national parks and nature reserves. It’s a lovely area, and a very popular holiday spot for Aussies. I left the main highway and headed up a series of narrow, winding roads that led through parkland and out onto Cape Byron, a rugged point of land that stretches out into the ocean. 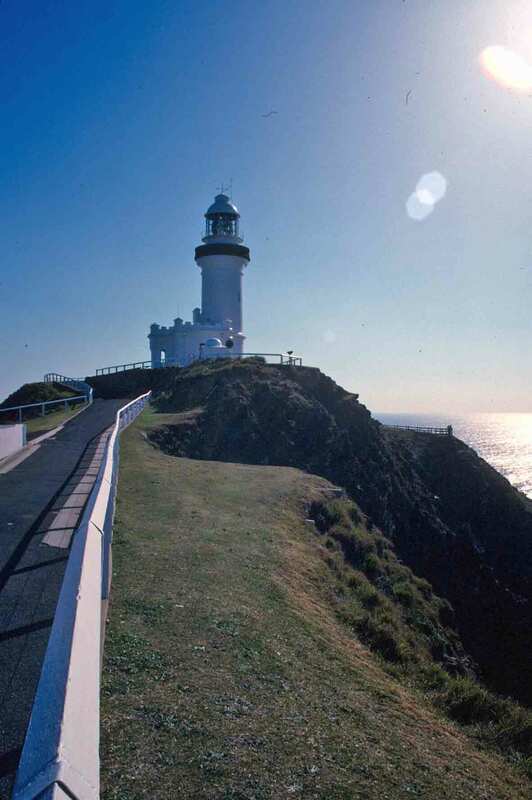 At the tip of the cape is the Cape Byron Lighthouse, which was built in 1901. Fun little bit of history: Cape Byron was named by Captain Cook (most stuff was on this side of Australia) in honor of his navigator, John Byron, who would in time become the grandfather of the great poet, Lord Byron. Because people who settled the area originally assumed the cape had been named for the poet, rather than the navigator, the town ended up with a lot of very literary street names: Tennyson, Browning, Marvell, Ruskin, Wordsworth, and so on. Made me smile. I hiked around the splendid, craggy, green-clad cape for about an hour, photographing distant mountains veiled in mist, crashing waves below, rocky cliffs, curving white beaches, the lighthouse, and all the foliage. Heading north once more, I regained the Pacific Highway, only to leave it again at Mooball, to follow the Tweed Coast Road–a blending of gorgeous horse properties, tacky beach communities, and glorious beaches and headlands. Before too much longer, I crossed the state border into Queensland, and a little before noon, I was in Currumbin. 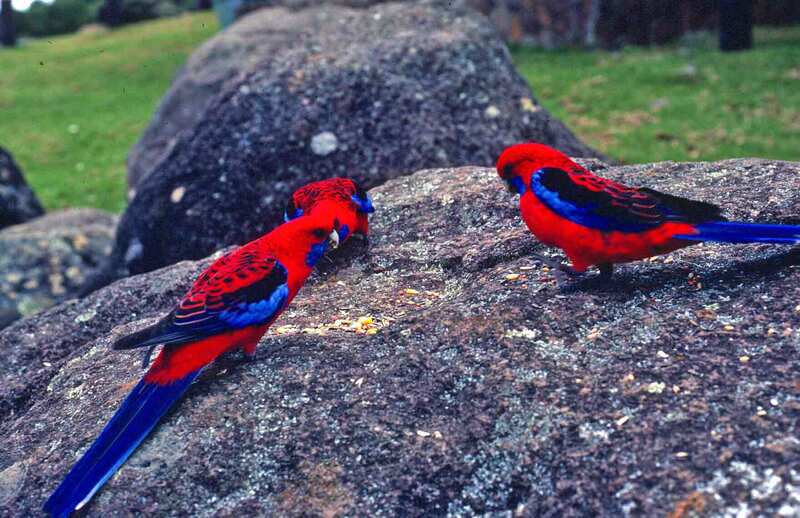 On my first trip to Australia, very early in my stay, I visited the wildlife sanctuary in Currumbin. It was my first immersion in the birds and wildlife of Australia. I’ve since seen more out bush, but I still wanted to return. They had changed the name, from Currumbin Bird Santuary to Currumbin Wildlife Sanctuary, and there was a greater emphasis on animals this time—but it was still fabulous. The birds were abundant and dazzling, but the larger numbers of kangaroos and wallabies made my heart sing. There were lots of other animals, of course, including plenty of koalas (which I happily photographed), but the ‘roos and wallabies were all about, grazing amidst the visitors, and I was overjoyed. I spent about 2-1/2 happy hours wandering through the beautiful grounds, photographing trees, flowers, and critters. It was wonderful. Ballina is a somewhat low-key resort area, with an emphasis on water sports and seafood. As a result, there are dozens of motels. I had to backtrack a little, since I couldn’t read all the signs on my first pass (traffic moves pretty quickly), but it gave me a chance to assess my surroundings. The All Seasons Motor Lodge is not quite as posh as last night’s lodgings, but then I suspect being in a resort area means you get slightly less bang for your buck. Also, the two previous locations have been in far lovelier settings, surrounded by trees and nature, rather than on a busy commercial street. But all that said, it’s still quite pleasant. As with the other places I’ve stayed, it has all the amenities one might want, including tea-making facilities. I just don’t imagine I’ll awaken to birds in the morning. I settled in and then to a stroll through town. There are several nice little take-away shops and some pleasant-looking restaurants, several stores and small shops, a couple of car dealerships, and a massive RSL (Returned Servicemen League – like VFW in the U.S.) club that takes up a whole block and is a couple of stories high. It’s the kind of mix one expects in an area that focuses largely on sport fishing. I stopped at a little open-front market and picked up some bananas, a custard apple (which I’d been told I must try), and an “ashi fruit” – or that’s what it sounded like. The lady running the market had to look it up, but she said it’s supposed to be sort of a cross between an apple and a pear. She was charming, and I chatted with her and a few other shoppers. Then back to the motel. The restaurant here is not a bargain, but I’m tired and don’t feel like trudging off to see if I can find somewhere cheaper (possibly without success, in a resort area). Besides, so far, the restaurants in the motels where I’ve been booked have been quite good, with nice, fresh food. And this was no exception. For “entrée” (which, in Australia, as in Britain, means the course that brings you into the meal—the appetizer—rather than, as in the U.S., the main course—and to be perfectly honest, this definition makes more sense) I had a prawn and bug cocktail (bugs here are what Europeans called “slipper lobsters”—a lovely, sweet crustacean). It was an extravagance, but it’s something I haven’t had since my last trip to Australia, so I couldn’t resist. My “main meal” was a whole, fresh red snapper, grilled with lemon-parsley butter. Delicious. As has been the case so far in each place I’ve stopped, the menu was delightful and the restaurant was nearly empty. I hope this is a seasonal thing, and that warmer weather brings bigger crowds. It would be a pity if these places couldn’t stay in business. After dinner, I went for a short, moonlit stroll around the block (looks like a full moon, or close to it, tonight). I then headed back to the room for an evening of sorting through documents and preparing for the next part of the trip.